“It does seem slightly bizarre that two of Britain’s greatest writers of supernatural fiction, Algernon Blackwood and Arthur Machen, should be connected by dried milk.” (Ashley, p. 120). I am immediately on board, with any book which included this sentence. 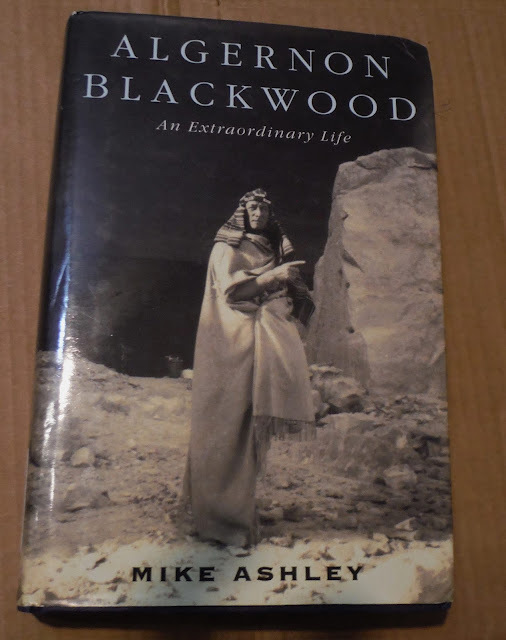 Mike Ashley’s Algernon Blackwood: An Extraordinary Life (New York, Carroll & Graf: 2001), which appeared in Great Britain as Starlight Man, is an engrossing, profound portrait of Algernon Blackwood, writer, traveler, adventurer, spy, and mystic. As I have mentioned elsewhere, I first ran across Blackwood's short story The Willows in a Scholastic anthology, at the age of 11 or so; and even then the numinous prose stuck with me. Recently, I read Episodes Before Thirty, Blackwood's own memoir; a good baseline for regarding Blackwood’s outlook. Mike Ashley’s book further, and extensively, illuminated Blackwood’s history – doing outstanding work, especially considering the gaps in the paper trail from the author’s life. Seemingly, the author knew everyone, encountering such disparate figures as P.D. Ouspensky, Rainer Maria Rilke, Lord Dunsany, Gurdjieff, and Sir Edward Elgar, among others. With a life starting in the Victorian Age, running through two world wars, and then ending in the atomic age (in fact, as Ashley detailed, Blackwood was a frequent contributor to radio, and pioneering television broadcasts as well). The only minor concern I have with the book is that the discussions of various works (of which I still have many to read) include frequent spoilers. A rewarding and worthwhile adventure.